Optimizer makes satellite data easy – with the devices you already own. Optimizer is the original BYOD (Bring Your Own Devices) satellite hotspot – letting you access the services you need with the smartphones, tablets and computers you already have. Optimizer broadcasts your satellite data feed as a Wi-Fi hotspot, let you easily access email, web, weather and social media services, and even track your location. Most importantly, its powerful firewall blocks all unwanted service to eliminate runaway satellite phone airtime bills. 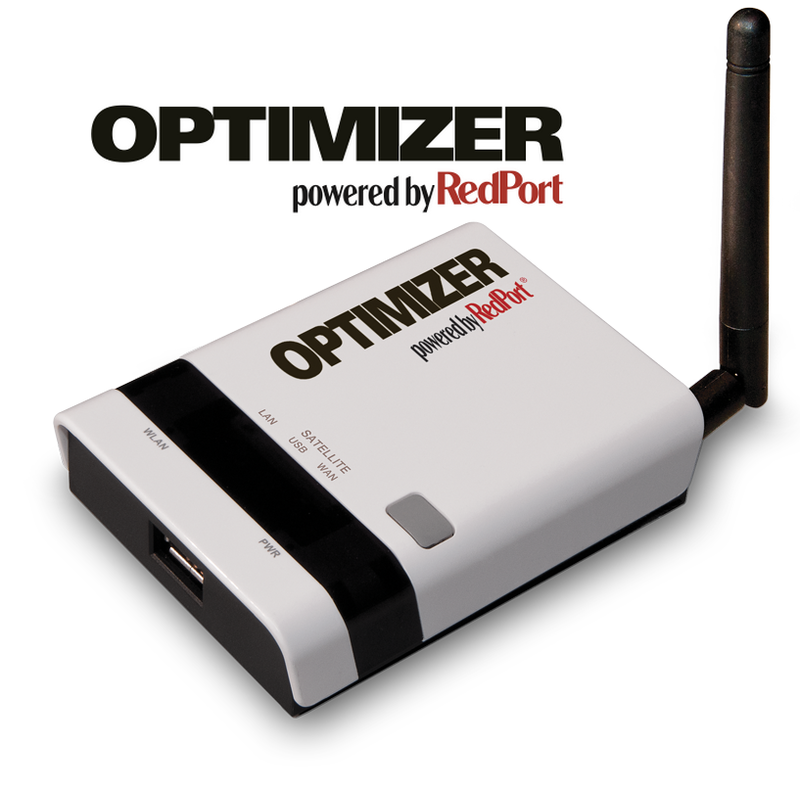 RedPort Optimizer eliminates the problems associated with USB cables, and boasts a firewall that eliminates all unnecessary computer traffic, giving you access to the maximum throughput of your satellite phone data service. Indeed, the built in firewall blocks ALL traffic except that carried through a RedPort-certified data service like XGate, a branded version of XGate, or Iridium Mail & Web. This means that once the link is established data flows through the pipe at optimum speeds giving you the best possible transfer rate. This allows you to browse the Internet with XWeb compression increasing the effective bandwidth of the connection while reducing airtime costs. Since nothing traverses the router except XGate email and XWeb compressed web data, unwanted traffic is eliminated. This prevents surprise airtime bills caused by unmonitored and unwanted background computer traffic such as operating system and other software updates. GSM support – Plug in a compatible GSM USB-modem when you have GSM access to keep all the speed and convenience benefits of Optimizer, wherever you are. Faster processor – Do everything quicker and more smoothly, the Optimizer wXa-122 (Autumn 2016) includes a new processor for speed and reliability. * Some Equipment Requires Compatible Serial-USB cable (not included). GPS Tracking service requires current Inmarsat or Iridium OpenPort hardware.